Rumors of my demise are greatly exaggerated! Granted I have been lax on my wildlife posts, but there is a good reason for that – namely I have been busy busy busy. Halloween has now wrapped up, which means I’m on the clock to get all the haunted trail and prop making posts out on my other blog. Add to that some medical procedures to recover from and the accounting year is winding down at my day job which means extra time to get loose ends straightened up before the holidays hit. Of course, these are still not good enough to warrant keeping my loyal wildlife readers devoid of fodder. With overwhelming guilt I bring you today’s featured bird! Before the hate mail starts pouring in, I realize this isn’t my best work behind the shutter. These images are a bit soft likely due to the brief window of time available to get any shots of this interesting bird. These are the only three shots that made it into the tin on this encounter. This specimen was located on our Georgia Birding Trip back in May 2015. If it wasn’t for the high pitch call emanating from high above in the pine trees I would have never found it. I’d zero in on the call, get The Beast pointed in the general direction only to find that the sound was coming from another area in the trees. Repeat process, repeat results. All of sudden, a bird popped out in the opening. Got the camera on point, snapped two shots and a final one as it moved off through the branches – that’s it. One chance, three quick images and birdy went bye bye. It is amazing how many times this plays out on our birding trips. A few minutes before that or a few minutes after that and you wouldn’t even know the bird was even in the area. People ask me if birding gets boring – definitely not – when you consider these brief encounters during the course of a day’s outing, think of how many chances you missed, how many different species you might have seen or what was simply sitting in the tree quiet as a mouse just laughing at your inability to find it. This happens to be one of those times where the excitement of the experience wasn’t truly appreciated until many years later in the digital darkroom. 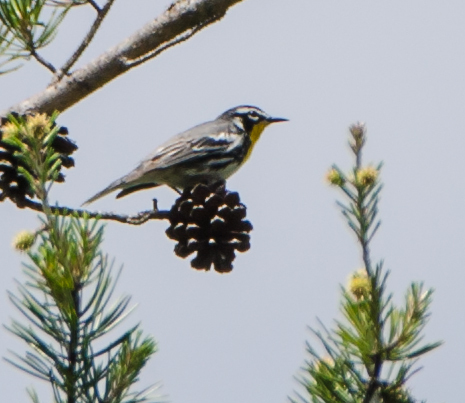 The original encounter was cataloged as another Yellow-Rumped Warbler. Better understanding of the difference in songs should have given a clue, but that is a definite weak spot in my game. Both are fairly high pitched in their song and their color palette is remarkably close. 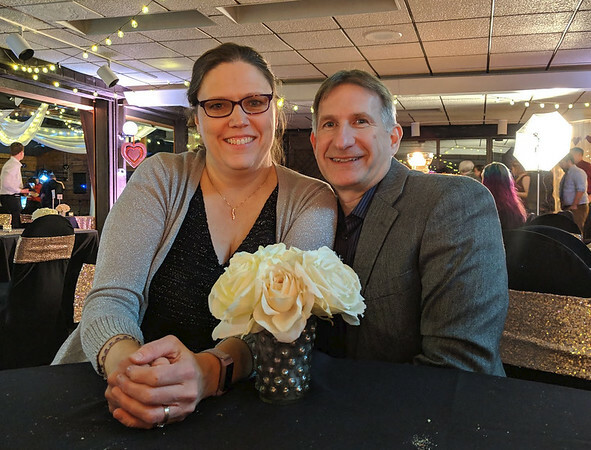 A lot more details surfaced when processing the RAW images. Like the Audubon variety of the Rumped, they both had yellow throats. What caught my attention was the extra white and black patterns of the head. 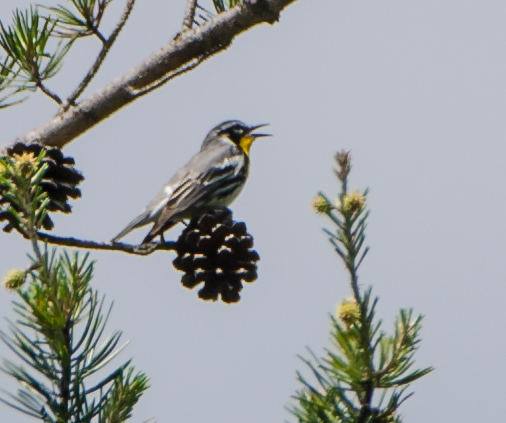 A quick look at my reference collection confirmed this was not a Yellow-Rumped Warbler, rather a Yellow-Throated Warbler. Let’s all take a moment to celebrate another check on my birding list. By then I was kicking myself the pictures didn’t come out as crispy as desired. On the positive front, at least they were good enough to properly ID the bird – was also able to confirm it with my brother Ron. Fingers crossed he doesn’t already have one so I can get a little closer to his current count. Being that this is a new bird, how about we jump over to Cornell to see what interesting things they have to say about it. 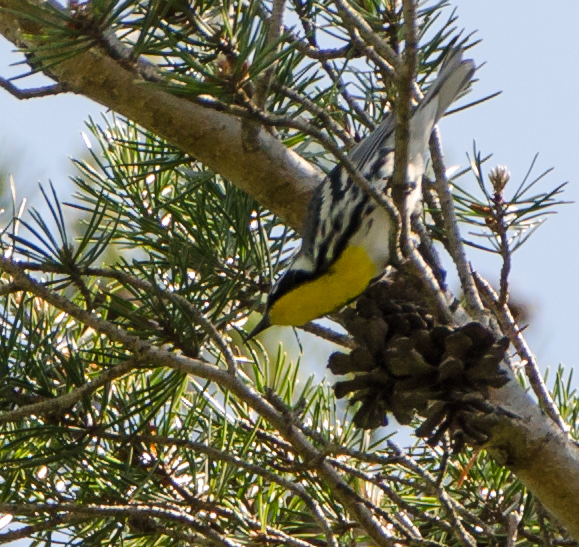 This is a Warbler who calls Southeast US home in the summer. Confirms with our shooting location and the time of year. 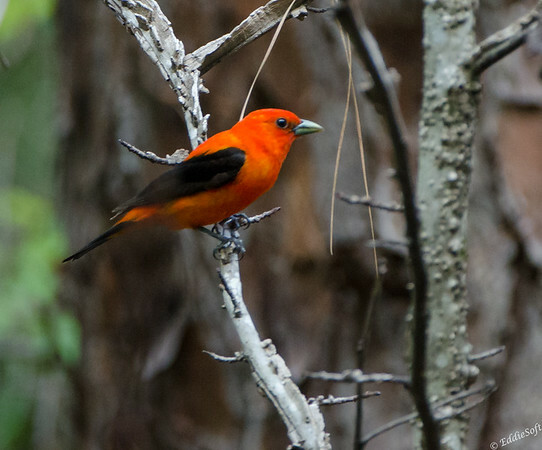 It is also considered a canopy bird preferring to hang out in the upper sections of pine trees. Well, we can definitely confirm that based on the pictures and how sore my neck was after the encounter. Prefers insects and spiders which means it is dear to me – based on my short time in Georgia, anything that might dent the population of No-See-Ums down there is tops in my book. Cornell is pretty sparse beyond those few tidbits. Again, sorry about the quality of picture on this set. These hyper warblers are always a struggle to freeze. Hope you enjoyed my new addition to my North American Birding List.